This page was born out of reminiscing about diesel hydraulics, it's some memories of the end of steam and the changing diesel scene in the early to mid 60's when I lived at Paignton. The Torbay Express was one of two Paddington -West of England trains where the train engine and main portion, including the diner, ran to and from Paignton and Kingswear. As such it was a must see and I used to, weather and parents permitting, run down to Paignton station straight from school to see the down train. Normally a Swindon or North British D800 Warship diesel it had the added interest that sometimes Laira examples would appear rather than our normal Newton Abbot based ones, however, their reliability left something to be desired and steam could and did appear fairly regularly in 62/63. Always a Castle when I saw steam on it and most times it was 4037 The South Wales Borderers, one of the Stars that was rebuilt as a Castle before the logic of rebuilding only the later Stars lead to a change of plan. Slightly later in the 60's, after the Waterloo - Exeter line was downgraded, the Torbay used to attach and detach an Ilfracombe portion at Exeter, the up train the loco had to come off, run out clear, set back on to the Ilfracombe coaches, then pull them out and set back with them. The Torbay line's other through loco and diner working detached a Plymouth portion at Newton Abbot which right to the end of steam west of Taunton on the Western was worked on to Plymouth by a Castle, 7022 Hereford Castle comes to mind as a regular performer at least the times I managed to get to Newton to see it. Kings: The Torbay was also one of only three trains that I saw worked by a King, when I saw the up train hauled by 6018 on a lovely summer day. The first King I saw in service was 6027 King Richard I which was standing in New Sidings by Goodrington Sands Halt in immaculate condition waiting with an up train, shortly after that I saw 6026 King John at near enough the same place in similar circumstances. Torbay's last Steam turn was also to be seen at Paignton just after the down Torbay Express, on the final leg of the duty. It was actually a Taunton Hall (or rarely 73xx Mogul) turn which started with a Parliamentary (all stations) service from Taunton to Kingswear where the stock was stabled until the last leg of the turn. The loco then worked the Kingswear portion of the Cornish Riviera up to Exeter St. David's - the Riviera never deigned to call between Plymouth and Exeter except to attach a pilot - was turned then returned to Kingswear with the down portion, from whence it worked the up Parliamentary to Taunton, which crossed the down Torbay Express in the Paignton/Goodrington area. 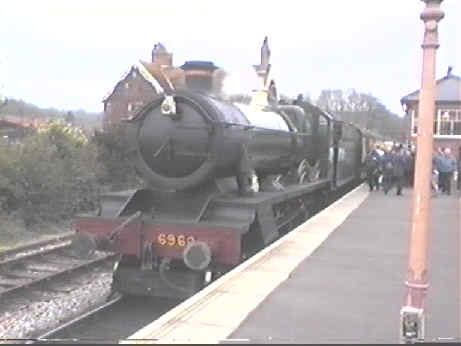 6960 Raveningham Hall at Bishop's Lydeard, West Somerset Railway. Same turn, but with diesels: once diesels took over the diagram it was generally a Laira NBL D63xx, until driver training on the Westerns started in earnest when it was used for driver training on them. 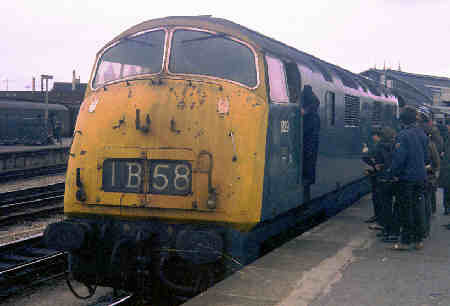 D1057 Western Chieftain, pictured below, was a regular performer as was D1068 Western Reliance (also pictured below), but others included most of the last few originally to be Swindon built but which came from Crewe in the end, the D1030 to D1034 batch. It also saw Hymeks when the final batch were based at Newton Abbott for a while. An interesting working that could bring more surprises and variety than all the other workings on the Torbay line. It also lead to a rather odd situation with the Riviera for a time the Torbay portion was worked by a Western while the full train was worked by a Warship. 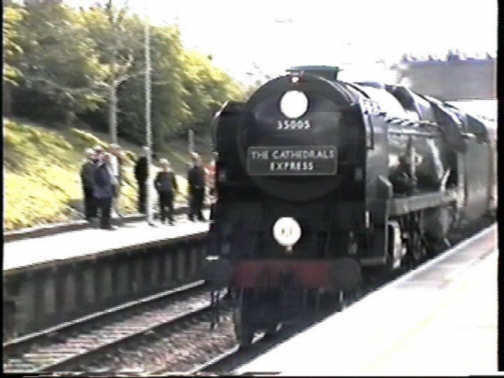 The pace of this service, the 10.30 from Paddington was such that the first portion of the Atlantic Coast Express, 11.00 from Waterloo, was into St. David's early enough for passengers to use the ACE then change on to the Riviera ! The last days of steam on the withered arm. From 1963 on I managed to get up to Exeter fairly often on a Saturday, where apart from the above workings there was plenty of steam in evidence on the ex Southern lines. On my first visit the bankers waiting at St. David's were a pair a radial tanks and a W, only the W performed in my brief visit, on subsequent visits the banking was all done by later 57xx pannier tanks. The major interest in those days was up at Exeter Central where the Waterloo services were joined and divided, with portions going onto Barnstaple (where they divided again for Ilfracombe and Torrington) and Okehampton ( where they also divided again, the ultimate destinations being Plymouth, Padstow and Bude. The motive power west of Exeter was mainly light pacifics, rebuilt ones were not allowed on all the routes so even if steam had continued not all would have been rebuilt, but N's put in an appearance from time to time. Up trains were all banked from St. David's up to Central, each Waterloo bound train being in two parts meant that you had real bursts of steam activity with only a short space of time between the two portions and each had to wait for a banker or two to come on the back before the whistling needed to synchronise the start of all the locos echoed around the station. You could often hear the barking exhausts all the way up until they reached Central, briefly muffled as they passed through the tunnel half way up the bank. The through Brighton - Plymouth and return services were an exception in that they didn't divide so it was a heavier train to lift up the bank, always taking two bankers. The heaviest trains though were the ballast trains from Meldon Quarry to the Civil Engineers depot at Woking, these always took a plot as well as two bankers, in the later days all pannier tanks but at one time Z class 0-8-0T tanks were used. The number of locos made the whistle signals even more complex and prolonged, then it was an all out effort from all four locos which was clearly audible all the way up, you could hear each shut off in turn as they breasted the summit. Up at Central there was a variety of steam power, light pacifics and Merchant Navies on the Waterloo services, though I did see a BR Standard 5MT 4-6-0 on one once and Ns appeared on some workings from North Devon. 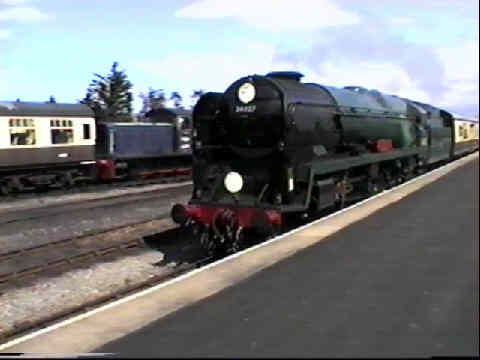 Besides the panniers doing the banking there were several Ivatt 2MT 2-6-2T tanks based at Exmouth Junction which mainly did station pilot duties - I was once lucky enough to have a ride in the cab of 41272 from one platform to the other. From left to right: an unrebuilt Battle of Britain light pacific 34072 257 Squadron, a rebuilt West Country class light pacific 34027 Taw Valley, a rebuilt Merchant Navy class pacific 35005 Canadian Pacific. On my first visit to Exmouth Junction depot there were 60+ steam locos there, just 2 1/2 years later there was just one, Dartmoor, a West Country pacific which had worked down from Salisbury in place of a failed diesel, while I was there a Standard class 4MT 4-6-0 passed by hauling a train load of invalid carriages - I've photos of both but for the moment can't put my hand on them. 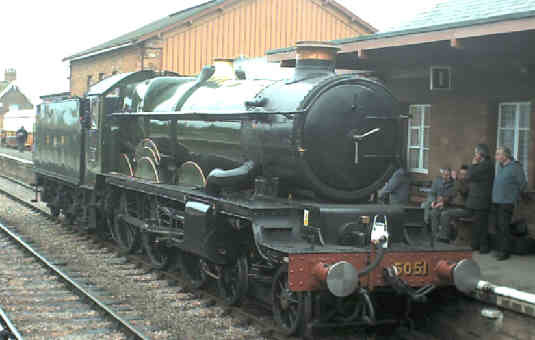 The first one I saw in Devon was the famous 4472 Flying Scotsman which had worked a special to Taunton where it handed over to a pair of 73xx 2-6-0's which took the train to Barnstaple via the GW route, then down to Exeter on the Southern line where 4472 took over again. 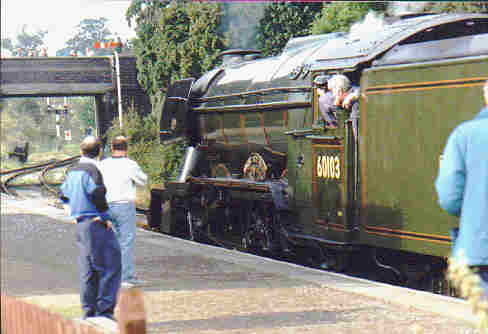 Flying Scotsman as now preserved with its BR number 60103. Another Gresley pacific that I saw at Exeter was 60024 Kingfisher which came down from Central to St David's before heading on.